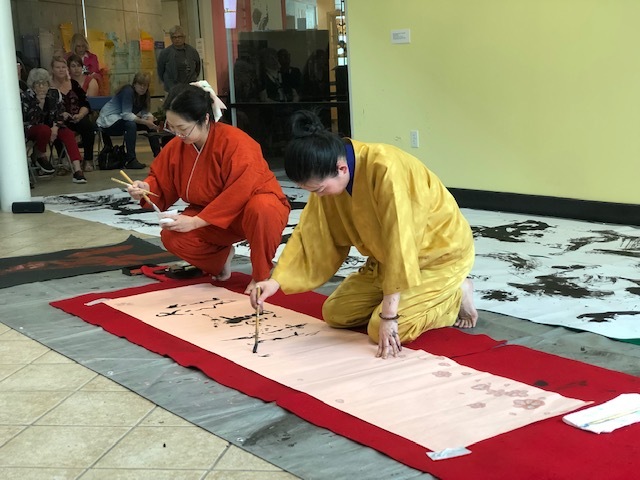 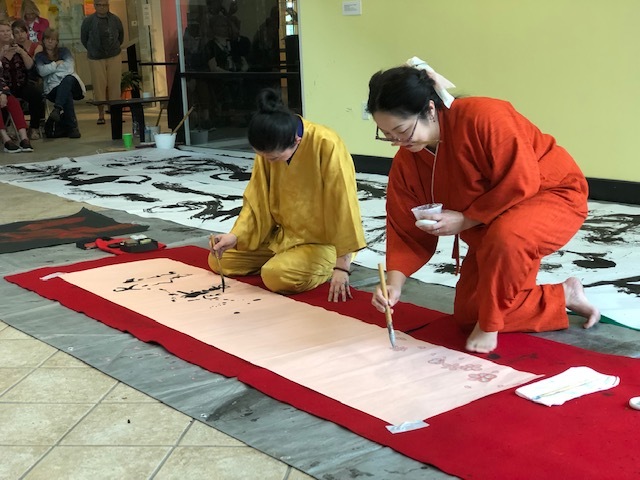 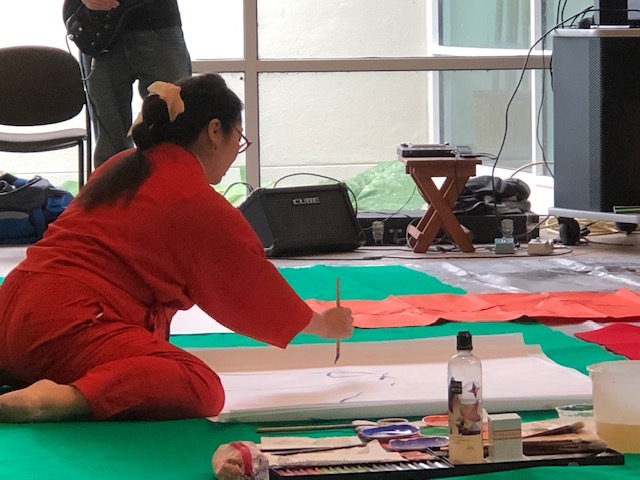 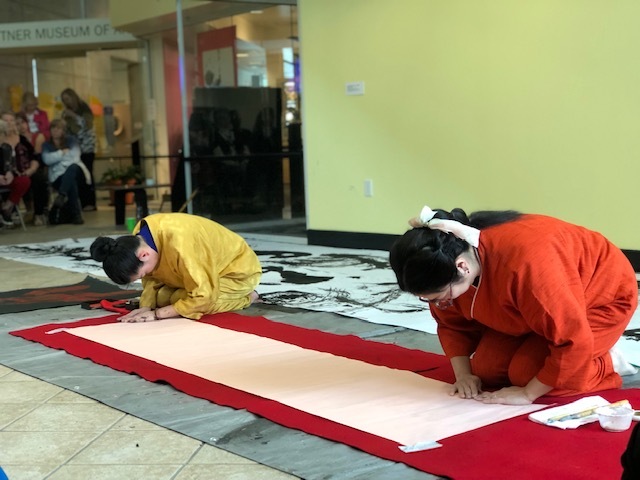 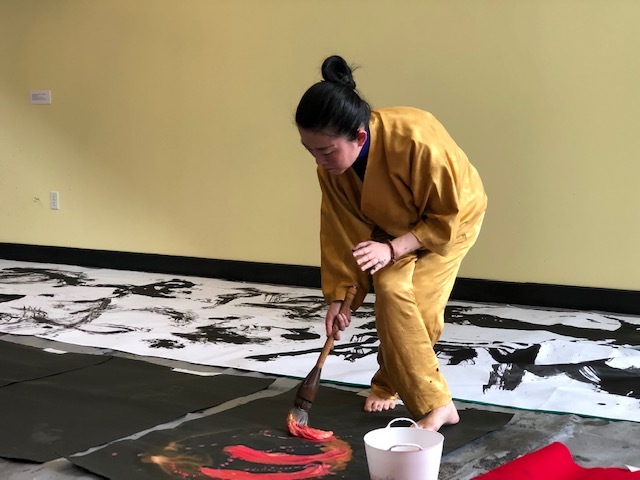 On March 19th, at the SPC Tarpon campus, a celebration of women, Japanese culture, and modern art was held. 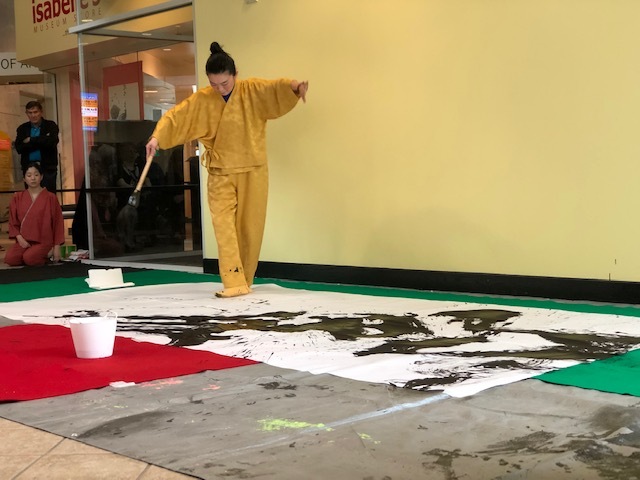 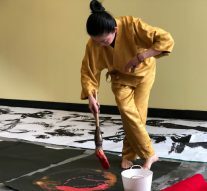 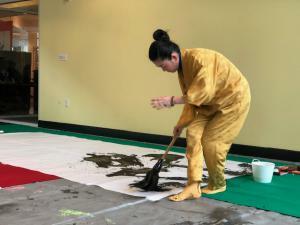 It showcased two well-known Japanese performance artists, had a plethora of different types of sushi to taste at a large buffet, and talks from featured artists in the Leepa Ratner Museum of Art as well as tours of the museum. 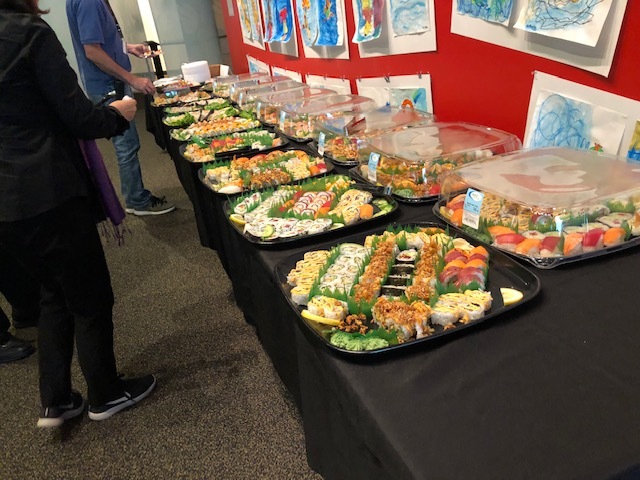 When people first arrived, they were directed to the Live Art section of the museum where they were overtaken by the enticing sight and smell of trays upon trays of varying sushi and sashimi. It was a colorful and delicious spread that let you eat to your hearts content. At 1:30, the art performances began. Firstly, there was Ai Kawamura, who specialized in water color painting. She laid out her paper on the floor, and, with the assistance of a live dancer, proceeded to create five unique and abstract paintings the centered around delicate and fluid paint strokes which effortlessly captured the graceful movements and spirit of the female dancer. 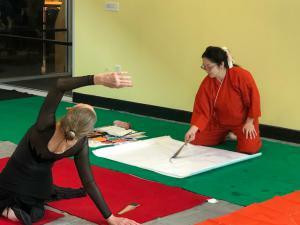 As one of the museum docents said, “She took the dancer and very minimalistically transposed it on paper. It wasn’t just in her head. It was like she was transforming the movement visually”. The entire experience was fascinating and calming to witness. 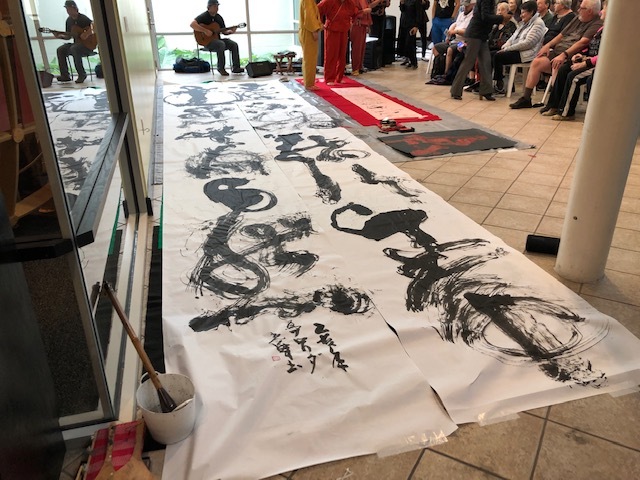 Next came the artist Koho Kurihara, who was a master calligrapher and had taken that skill and grew it through the incorporation of dance and music. 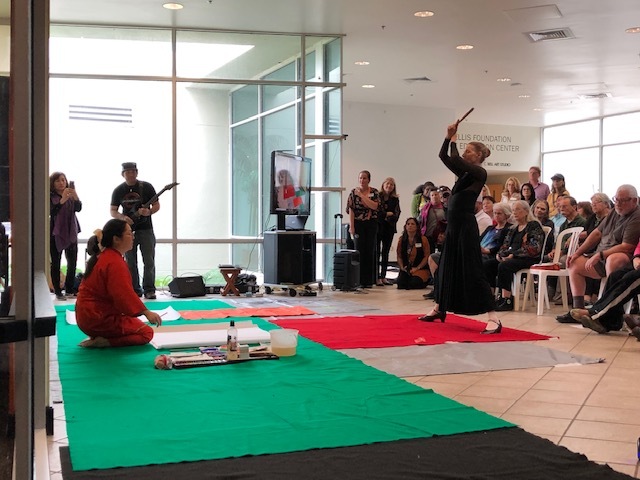 She held herself with dignity and sophistication, however once the music started, the enraptured audience was witness to her inner fire and strength. 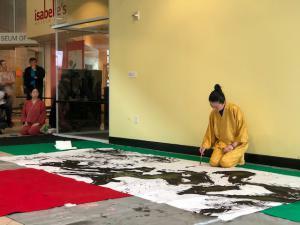 Large pieces of paper on the ground were her canvases and a giant horse hair brush was her tool. 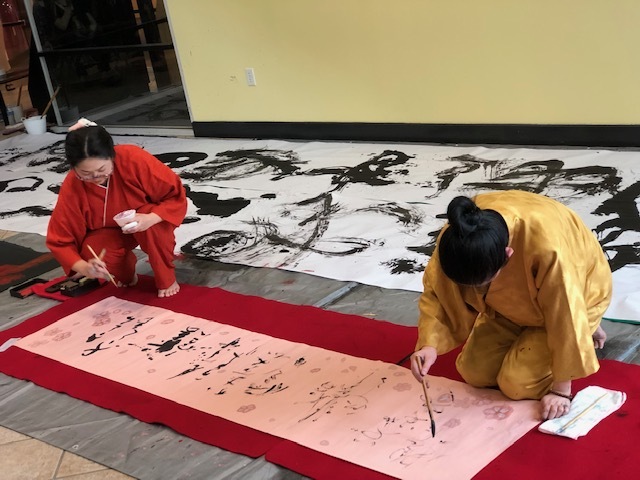 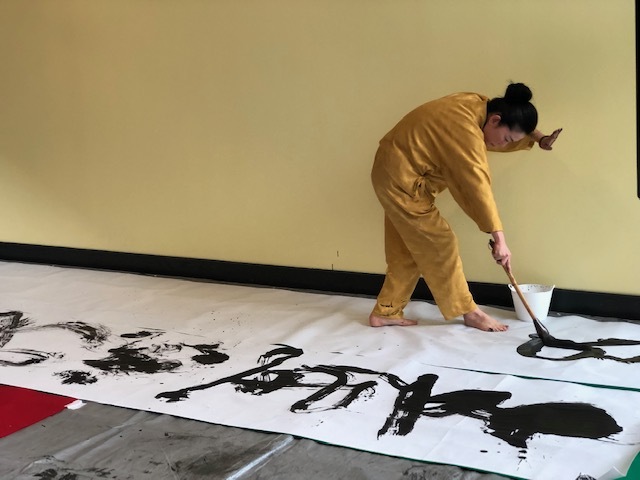 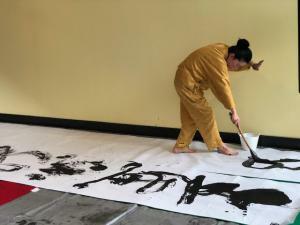 Koho proceeded to create giant calligraphy art piece through shouts and dancing. 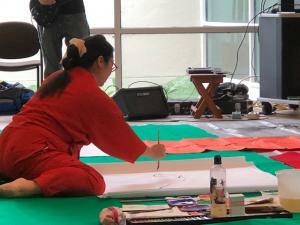 Watching her performance allowed the audience to see her passion and love for her craft. 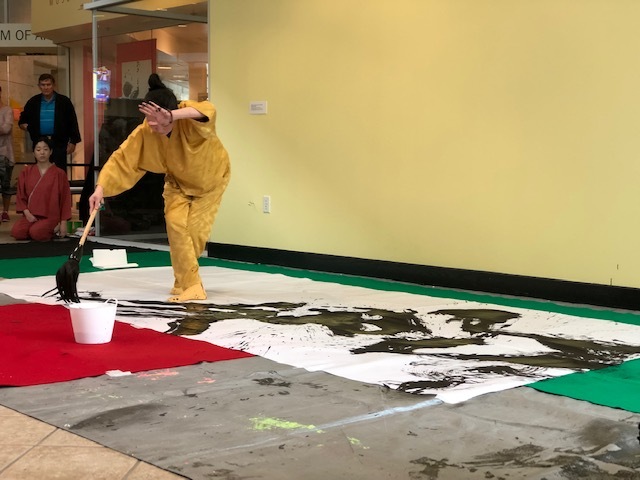 After two different painting were made, she then created an art piece to commemorate the director of the museum, Ann Larsen’s, hard work, seeing as at the end of March she will be retired. 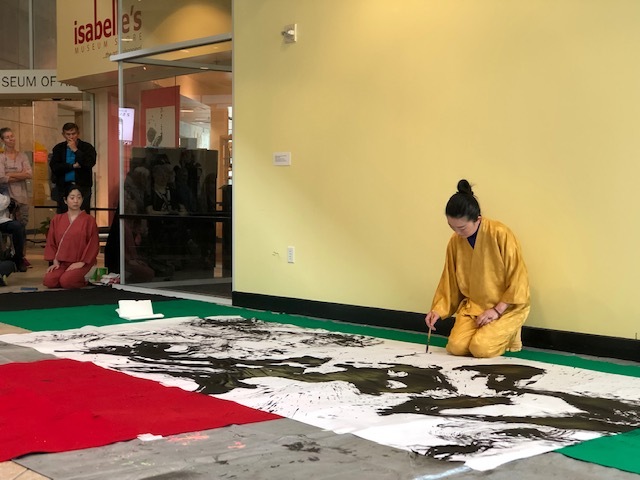 After both performances were completed, the two artist joined forces in a collaboration inspired by spring and the cherry blossoms. 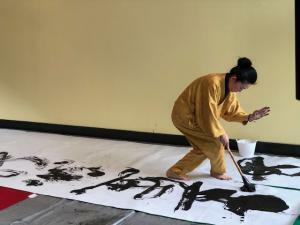 They did this all while accompanied by Marius, and ambient guitarist, who had composed a brand-new number that gave off a peaceful and melodic tone. At the end of their collaboration, Koho, called up the children in the audience and let them sprinkle actual blossoms over the painting and taught them to say thank you in Japanese. 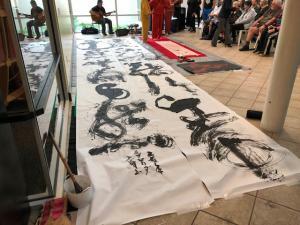 All the performances served to inspire creativity and expand the definition of live art. 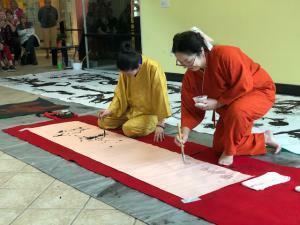 They both not only created beautiful pieces, but also led the audience on a journey with them. 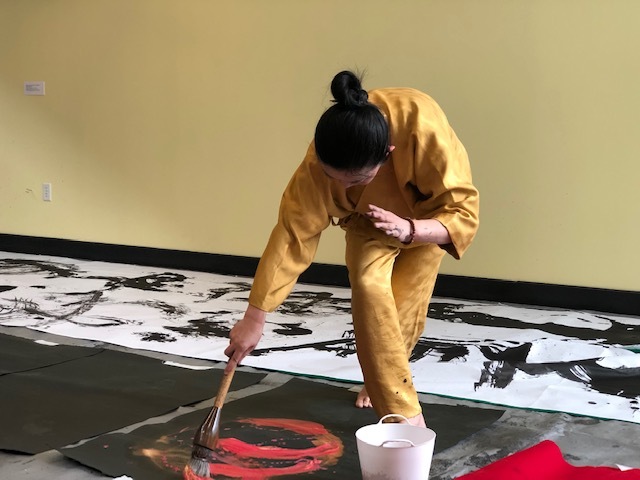 The audience was able to truly see the inspiration and vision that the women poured into their work. 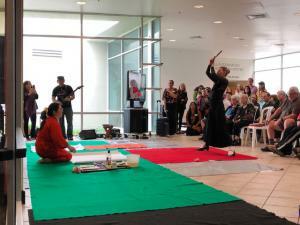 Following the performances there were several events scheduled. 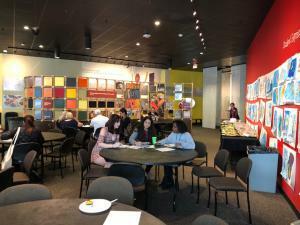 In th same room as the buffet there was an origami class that was held. 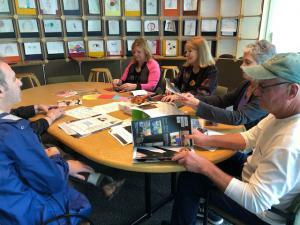 During this hour-long course, people were taught the art of creating origami boxes with unexpected mediums. They were using newspaper and colorfully printed papers and magazines, while an instructor guided the students in how best to go about creating the art and how they could put their own twist on it. 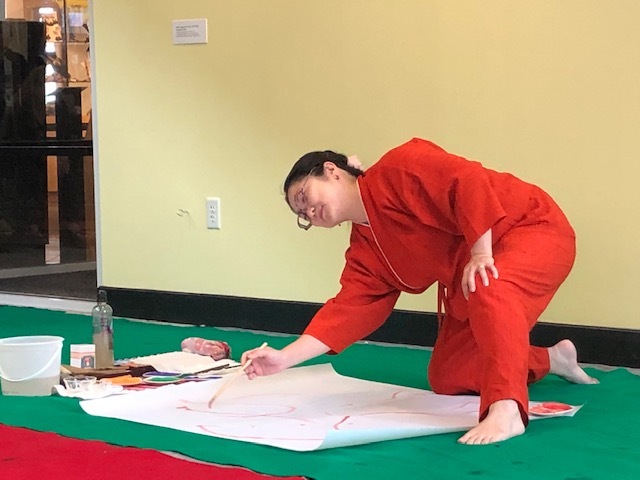 At the same time two of the featured artists, Akiko Kotani and Nathan Beard, in the museum exhibition UNEXPECTED: Art by Alternative Means gave a talk and opened the floor for others to ask them questions about how they went about creating their art and what inspired them. 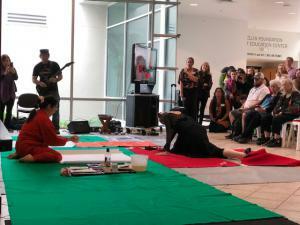 Overall, the whole event served as a colorful, fascinating and inspiring break for the chaotic day to day. 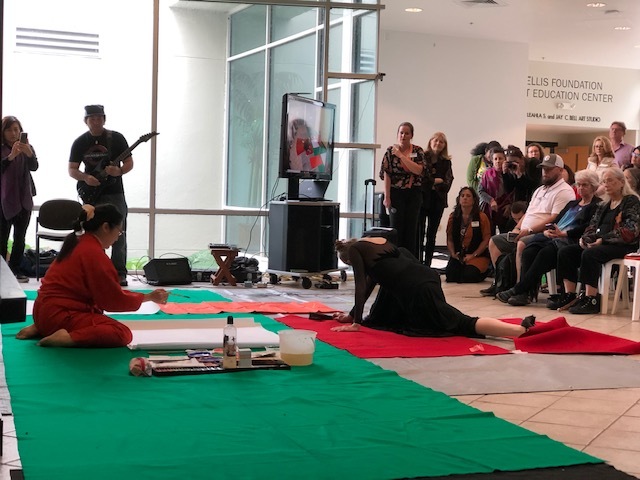 From the food, to the performers, and the talks with the artist the event should be chalked up as an amazing success and an eye-opening experience to the world of alternative art. 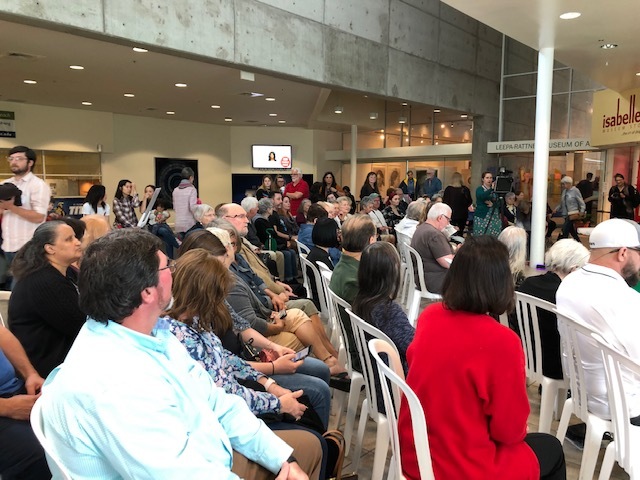 It also served as a showcase of many powerful and inspirational female artist coming together to commemorate Women’s History Month.